Movie taglines: you know the drill (actually the tagline for a dental-themed slasher pic whose name escapes me…). One, two or three sentences that sum up a film’s flavour or sometimes entire plot. To cineastes of a certain generation, a tagline can be as memorable as the movie itself. Some even become part of the modern lexicon. But what makes a good tag? Perhaps it’s common words uncommonly used. Horror and sci-fi films seem to lend themselves to memorable tags. Is it because of their promise of the perverse, the uncanny, the unexpected, the taboo? 11. ‘The Shining’ (1980): The tide of terror that swept America is HERE. A spine-tingler whose possible meaning is explored in excellent recent documentary ‘Room 237’. 10. ‘Ferris Bueller’s Day Off’ (1986): One man’s struggle to take it easy. Does the job perfectly in just seven words. 9. ‘Scarecrows’ (1988): When it comes to terror, they’re in a field of their own. 8. ‘The Fog’ (1980): Bolt your doors. Lock your windows. There’s something in the fog! Does what it says on the tin, but terrified me looking at the video cover in my local rental shop circa 1983. 7. ‘The Burning’ (1981): Don’t look, he’ll see you. Don’t breathe, he’ll hear you. Don’t move…you’re dead. Only really comes into its own when heard in the original cinematic trailer. 6. ‘The Fly’ (1986): Be afraid. Be very afraid. What does it have to do with the movie? Not a lot, but has entered the lexicon with ease. 5. 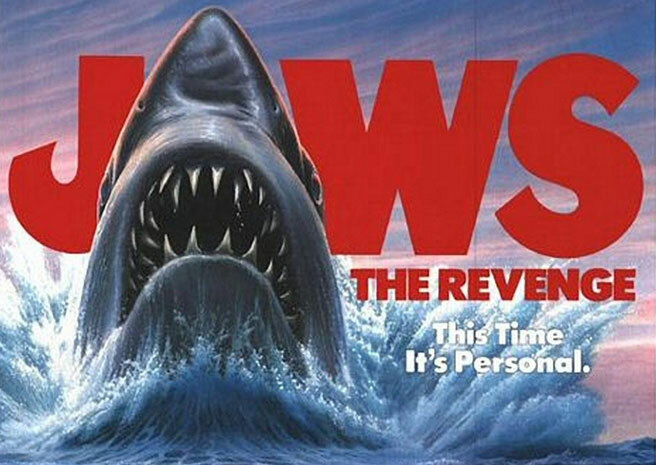 ‘Jaws: The Revenge’ (1987) This time it’s personal. 4. ‘Poltergeist’ (1982): They’re here. 3. ‘The Prey’ (1984) : It’s not human and it’s got an axe! 2. 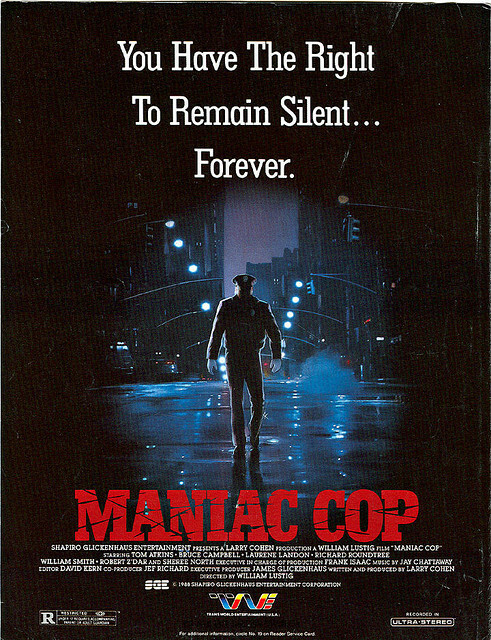 ‘Maniac Cop’ (1988): You have the right to remain silent…forever. 1. ‘The Thing’ (1982): Man is the warmest place to hide. Brilliantly evokes the movie’s underlying theme: what makes us human? This entry was posted in Lists, Movie Taglines, Movies and tagged ferrisbuellersdayoff, maniaccop, poltergeist, room237, taglines, theburning, thefly, thefog, theshining, thething. Bookmark the permalink. Classic line up and a good theme to explore. Was that dental malpractice horror called ‘The Dentist’?